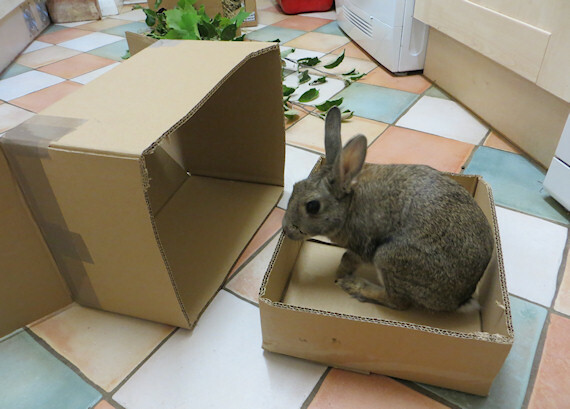 Boxes are one of the best toys for bunnies because they are so versatile. I decided to see how many toys I could get out of just one box. 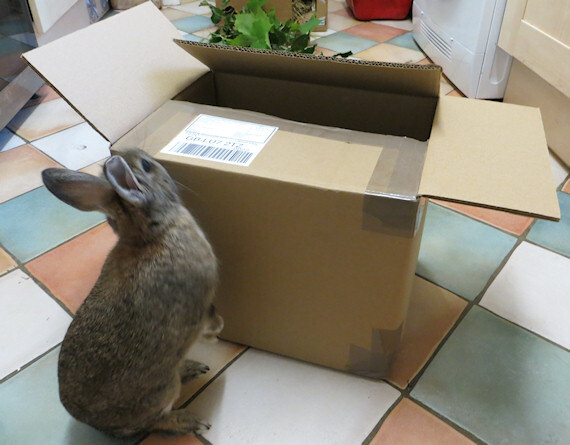 Here is the box; it’s a nice sturdy one that the printer sends my Understanding Rabbit’s Habits books in. Ooo, a new box for me! The first thing I did was cut all the way around about 3″ up from the base (and removed the tape) to make a tray. It makes a nice lounging spot/hay outpost/chewing spot – I tuck these in corners to help prevent unsanctioned chewing/digging. What did you do to my box! 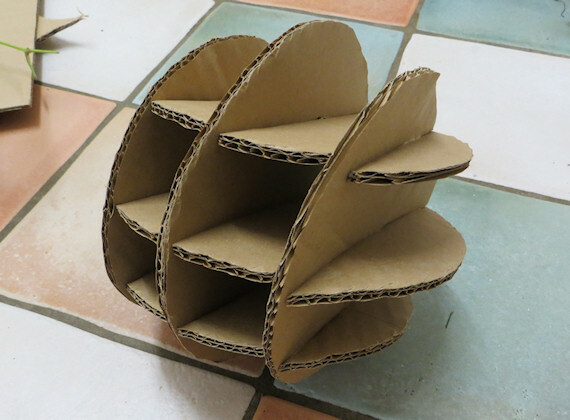 That left quite a bit of cardboard over to make some toys! I started by drawing around a bowl to get three circles. They can be whatever size you like, go for plates if you want something bigger. Watch out for my nose. Next cut them out with a knife or scissors. Scamp was banned from this part because he was at risk of losing whiskers. But he wasn’t gone for long. Now you need to make slots in your circles. Unless you are using very thin card, e.g. cereal packet, then rather than just cutting a line, cut an actual slot discarding a thin piece of card so the slot width is the same as then thickness as the cardboard. It makes them much easier to put together. Each circle needs a slightly different slot. Circle 1. Cut to the centre of the circle. Circle 2. Cut to the centre and then continue half way to the other side. Circle 3. 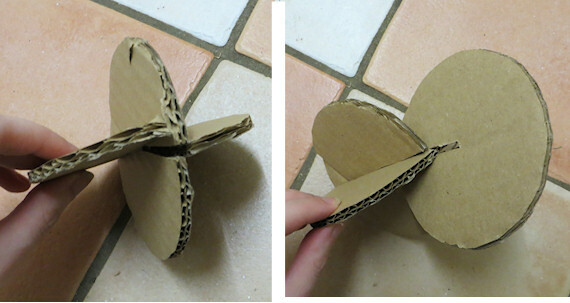 Cut to the centre, then make a second slot from the opposite side half way to the centre. The blue x marks the centre of the circle. Now assemble the ball by slotting the pieces together. Start by slotting together circle no. 2 and the short slot on circle no. 3. Then take circle no. 1 and, working from the same direction, slot that over the top. Slot together 2 & 3. Then add no. 1. 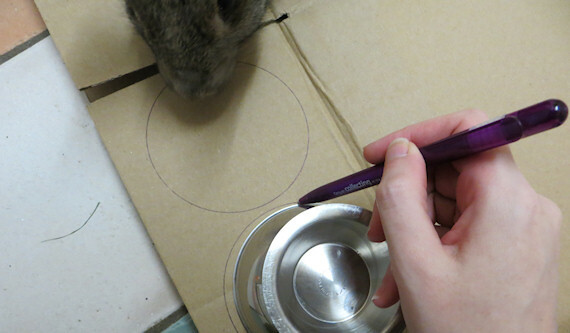 If you want to add a bit of extra fun, try making holes in the circles with a pair or scissors or jabbing it with a pen and then put pellets through them. After successfully completed one ball, I decided to get a bit more adventurous with a ball to stuff with hay. 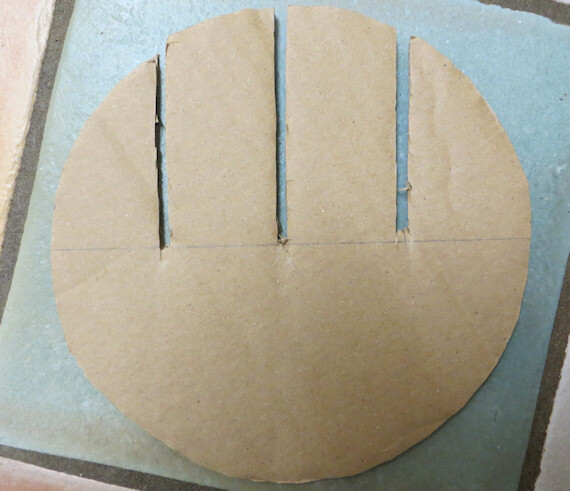 Again, cut circles but this time they need to be around 6″ or so across (or bigger) and you’ll need six of them. Then you slot them together. It looks complicated but just slot the first three on, and then it will be obvious where the last two go. Then stuff the gaps with hay and treats and hand over to your bunny! Okay, I forgive you for cutting up my box. Not a bad evenings entertainment from just one box! This entry was posted on Tuesday, October 28th, 2014 at 3:54 pm	and is filed under Toys & Enrichment. You can follow any responses to this entry through the RSS 2.0 feed. You can leave a response, or trackback from your own site. You always come up with this great toys. Thanks! I’m totally making these for my demolition squad! I just wanted to say that I absolutely love your blog. You have such fantastic DIYs for bunny owners and I am glad you provide such excellent content. 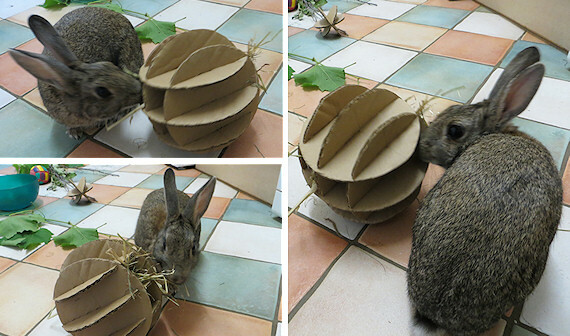 🙂 I can’t wait to make this cardboard ball for my bunny, Olive. I am going to make this for my guinea pigs! 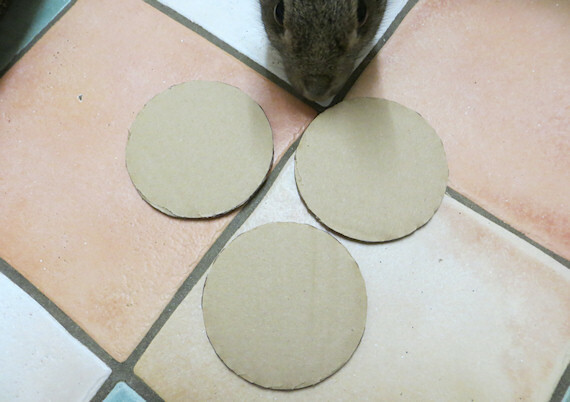 don’t the bunnies ‘eat’ cardboard? and if they do is it harmful? They generally shred it rather than eating it. If they eat a tiny amount by mistake it will pass through fine. 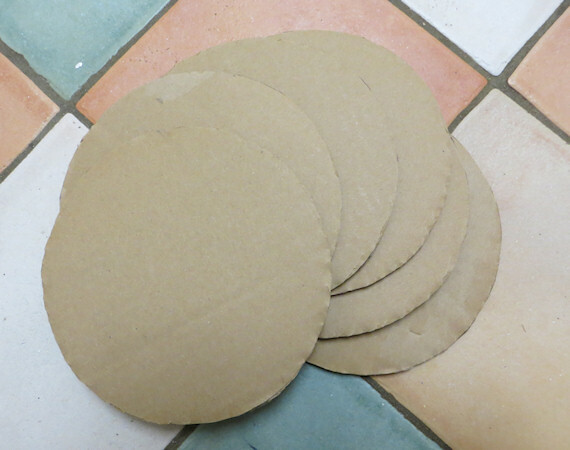 A few exceptions will eat cardboard in bulk but usually only if there is a lack of fibre i.e. hay in their diet. 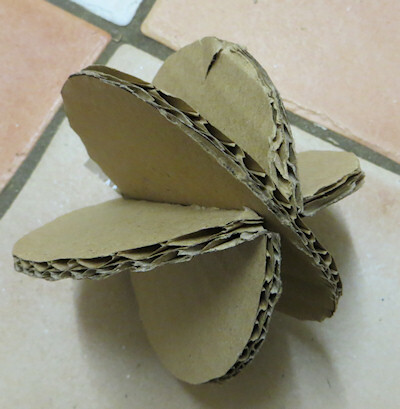 If you are good at DIY you could make the same shapes from wood. I'm Tamsin, and I like rabbits, such as Scamp on the right there. He's a wild rabbit I hand reared. I run a site that promote UK rabbit rescues (which incidentally is how I ended up with Scamp) and a few other rabbit related projects. If you would like to use the text or images on this site please ask permission first. Here are some free icons which you are allowed to copy.